This 5-hour pub crawl of Montreal operates year-round every Friday and Saturday starting at 9:30pm. 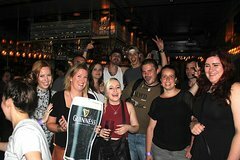 Your bilingual guide leads and entertains a group of international "pubcrawlers" to three awesome pubs and one of Montreal’s most renowned nightclub. Rest assured as this will be an epic night-out and one of the top highlights of your trip. Stops may include (but are not limited to) Point Bar, Saint-Ciboire pub, Ivy nightclub, St-Patrick's Pub, and Loup-Garou rhumerie et terrasse. You will travel by foot. All pubs and bars are located within 10 minutes walking distance or less. It is recommended to wear comfortable walking shoes. No hoodies, sport shorts, flip-flops, tank tops or baseball caps.